Multiple sources have confirmed veteran assistant crew chief Ronnie Thompson has left Al-Anabi Racing and headed for John Force Racing where he will join Todd Smith with the Brittany Force dragster. Read more about THOMPSON HEADED TO JFR? The traditional PRO Winter Warm-up at Palm beach International Raceway has long been a destination for the leading NHRA fuel teams during late January. We are told John Force Racing will skip the annual visit to South Florida and will instead test at Wild Horse Motorsports Park outside of Phoenix, Az. JFR is not the only fuel team expected to be there prior to Pomona. Read more about JFR SKIPPING PBIR TEST? BIG DEAL FORTHCOMING FOR MATT SMITH RACING? We are told Matt Smith Racing will soon announce one of the larger multi-year sponsorship deals in the Pro Stock Motorcycle division. Our sources tell us the plan is for Smith to field two bikes in 2015, one for him and the other for wife Angie. Matt Smith Racing will reportedly still lease race engines. Read more about BIG DEAL FORTHCOMING FOR MATT SMITH RACING? THE OTHER TUNER SHAKE-UP COMING? While we might have been a bit premature in our rumor reporting with the tuner shake-ups with one of the two tuners, word has it the other shoe is expected to drop in the next couple of weeks. Stay tuned as this one materializes. Read more about THE OTHER TUNER SHAKE-UP COMING? LEE BEARD GONE FROM NHRA? Multiple sources tell CompetitionPlus.com, former championship tuner turned NHRA employee Lee Beard, si now a free agent. We are told the NHRA has eliminated his position as a consultant to nitro racing. There's no word if the retired tuner plans to return to his former line of woirk in 2015. Read more about LEE BEARD GONE FROM NHRA? JEGGIE STEPPING OUT OF PRO STOCK? With one race left to go in the 2014 season, the rumor mill is starting back up again. Sources close to the situation have told CompetitionPlus.com that 2013 NHRA Pro Stock series champion will get out of Pro Stock at the end of the year to devote more time to family and business. Read more about JEGGIE STEPPING OUT OF PRO STOCK? VANDERGRIFF FORMING TECHNICAL ALLIANCE WITH DSR? We are told from multiple sources; Bob Vandergriff Racing will begin purchasing equipment and technology from Don Schumacher Racing for the 2015 season. Additionally, we hear Vandergriff's team will be based "very close" to Schumacher's Brownsburg, Ind.-based headquarters. Read more about VANDERGRIFF FORMING TECHNICAL ALLIANCE WITH DSR? TOUGH WATERS AHEAD FOR EXTREME PRO STOCK? Multiple sources have confirmed with CompetitionPlus.com rumblings about the future of eighth-mile mountain motor Pro Stock racing. We hear discussions are going on which suggest the racers will have to provide a set amount of sponsorship with the Extreme Pro Stock division to continue to exist in the PDRA. This style of Pro Stock racing has been divided since the IHRA racers defected over to the then ADRL, and then were forced to choose between the ADRL and X-DRL. Read more about TOUGH WATERS AHEAD FOR EXTREME PRO STOCK? NITRO TUNER SHAKE UPS COMING? Rumor has it there are some major crew chief shake-ups which will be made public as early as Wednesday. Our sources indicate as many as two top name tuners could soon be seeking employment elsewhere. 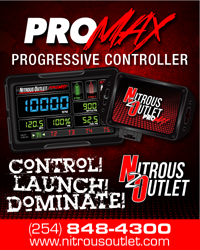 Read more about NITRO TUNER SHAKE UPS COMING? CHEAPER NITRO ON THE WAY? That's what we hear. In a bit of positive news, we hear with the incoming new nitro supplier Sunoco, the reported cost will drop below the $1,000 mark per 40-gallon drum. The benchmark for nitro pricing has been in the $1,100 mark for this season. Read more about CHEAPER NITRO ON THE WAY?